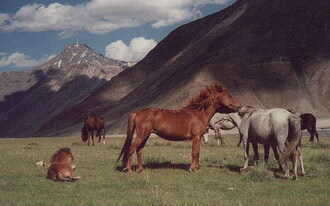 Zanskari Ponies are bred in the high altitude Zanskar region of Ladakh in eastern Jammu and Kashmir State of India. They are very similar to Spiti ponies but they are more adaptable for higher altitude where they are used as work horses. They stand 120-140 cm in height, and weigh 320-450 kg. Their coloration runs from usually grey to black, though some specimens are a reddish, coppery color. They are able to carry heavy loads at high altitude and are used for work. They are well built with prominent eyes, fine, long glossy hair, and a long heavy tail. Zansikari Ponies are strong and hard workers. They can carry heavy loads at high altitudes. They are also used for pleasure riding and showing, as well.